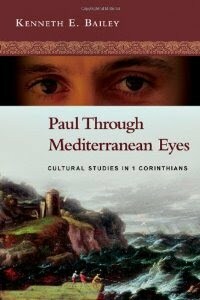 Many thanks to the kind people at IVP Academic for sending me a copy of Kenneth E. Bailey's Paul Through Mediterranean Eyes: Cultural Studies in 1 Corinthians. I plan to read and review the book here on the blog in the near future. Here is the book's description. Paul was a Hebrew of the Hebrews, steeped in the learning of his people. But he was also a Roman citizen who widely traveled the Mediterranean basin, and was very knowledgeable of the dominant Greek and Roman culture of his day. These two mighty rivers of influence converge in Paul's first letter to the Corinthians.With razor-sharp attention to the text, Kenneth Bailey examines the cultural milieu and rhetorical strategies that shaped this pivotal epistle. He discovers the deep layers of the Hebraic prophetic tradition informing Paul's writing, linking the Apostle with the great prophets of the Old Testament.Throughout, Bailey employs his expert knowledge of Near Eastern and Mediterranean culture to deliver to readers a new understanding of Paul and his world. Familiar passages take on a new hue as they are stripped of standard Western interpretations and rendered back into their ancient setting. If you are not already familiar with Bailey's work I suggest you also read his other books in which he applies his understanding of Mediterranean culture to the exegesis of the New Testament. Here is a bit of his biography. Kenneth E. Bailey is an author and lecturer in Middle Eastern New Testament studies. An ordained Presbyterian minister, he also serves as Canon Theologian of the Diocese of Pittsburgh of the Episcopal Church, USA. He holds graduate degrees in Arabic language and literature, and in systematic theology; his Th.D. is in New Testament. He spent forty years living and teaching New Testament in Egypt, Lebanon, Jerusalem and Cyprus, still holding the title of research professor (emeritus) of Middle Eastern New Testament studies at the Ecumenical Institute (Tantur), Jerusalem.